And now for something completely different: a 917 with flippers. How did this come into life, you ask? Well, rather logically, actually. I came to me in a dream a short while ago and then I had to draw it. 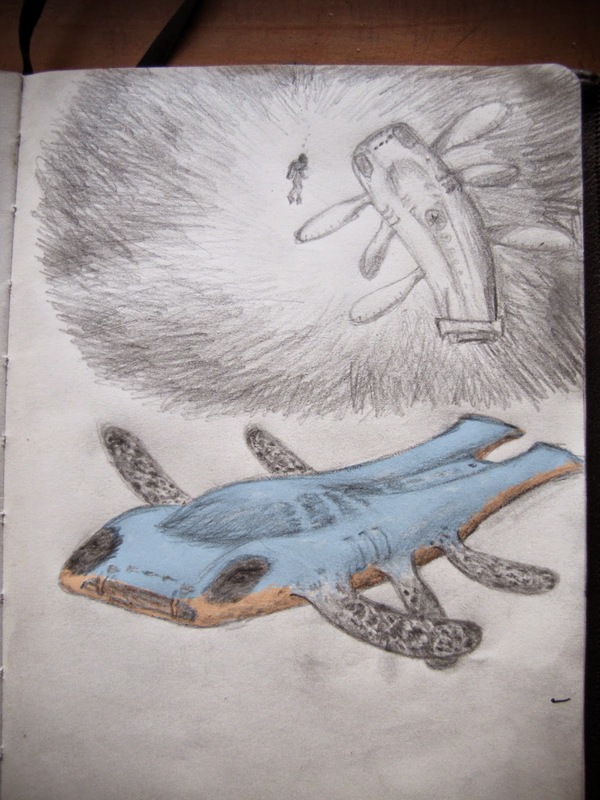 What you are looking at is a mixture between a Porsche 917, a Pliosaur and a Whale-shark. Firstly, I must point out that I'm a Paleontology student, passionate about my work, as well as Nature on a whole and classic racing cars - to witness the moment when my unconsciousness mixes them all is rather interesting. I think this came up because in the night before I saw the news that a 917 had just been sold for some 1.7 Million dollars, and I though "well, that's one dream car that I'll never own". Later I dreamt that I was watching a News program and it came up that "New undiscovered 917 specimen was just found swimming at great depth." (as if they had just found a new individual/population of a very rare living-fossil species until then unknown to inhabit that part of the ocean, like a Coelacanth). To my unconscious mind it meant "Good, maybe the prices will drop down if they find more unknown to exist individuals/chassis.". To my woken up mind it meant "Wow, did I just mixture quite logically to of my greatest passions?" It really makes sense: the 917 is such an organic looking machine, mistaking it for an animal (and of course, it had to be a legendary prehistoric great predator, since it is a classic racing beast) is an easy step, particularly since I deal so much with Mesozoic animals. And since it is such a rare living-fossil species of a car, the only way to find more is if there is an unknown population living in an unexplored part of the world. I really love the way my dreaming mind mixed these two so different worlds together! About the drawings, the above drawing is exactly how it came to me in the dream, like as if in a video report recorded in a deep sea dive. The bellow picture was made from a 917 picture to what I imagine this animal would look like, later added colour in the computer as a quick experiment. Notice that the above drawing has a spoiler like the prototypes and the beginning of the production of the car, before they were "tamed" with more stabilizing rear-ends (another analogy, since this "animal" never had contact with humans and still needs to be tamed). I gave it small eyes in the middle of dark patches in the shape of the headlights like Killer-whales or Pandas, a mouth like a Whale-shark (they do look very alike), with similar barbs dividing the side openings and tried to make the small openings around pose as sensory organs. Gave it gills where the doors should be, turned the top vent into a big scute followed by smaller ones and the tail was pretty straight-forward (I mean, it is called a tail in motorsport for a reason! and it could have been in any of the shapes the car sported throw its career). Why six flippers? That's the most Pliosaur-like feature, who had only 4, but I remember clearly in the dream that it had 6. Maybe I associated with the V12 engine, which I think is quite poetic! The colour was just a quick dashing, also tried to make the flippers blacker like the tires, in all it is just a rough sketch, possibly in the future I'll try to draw a more detailed and life-like piece. Should I develop it? Did I got it all right on how a Mesozoic 917 living in the oceans should look like? Do you have any creation similar to this one? You need to stop smoking those funny cigarettes. Well, since I can't avoid looking at classic cars as if they were living beings underneath (while modern cars just look like a bunch lifeless metal and plastic), this was quite unavoidable. I found a fossil that looked just like that back in the day at the Moraine esker. My silence about all those crazy stuff you have been talking above has a reason, and also, I have been thinking about Joe's last words just above. I decided to wait until this morning , to confirm if I was really crazy reading things that was not possible to be true in real healthy minds, in this thread! But now I can see very clearly that I'm OK! You all are totally mad in fact! You all maybe have been smoking some kind of special cigarettes, or smelling some kind of white powder, who knows? You are totally crazy, and I worry about tha,t but I love you all even with those behavior. Oooops! BTW, sorry about my poor english, but I'm sure you could understand my long, long talk! Hahahaha!I wish you a very nice weekend and a happy Easter, my beloved friends! A Happy Easter to you my good friend Ney!!!!! Big Man hugs to ya old chap!! !